Benjamin Franklin narrated and lived the Great American Success Story. As America�s prototypical polymath, the excelled�and even defined�a number of professions including printer, writer, postmaster, scientists, inventor, public citizen, politician, and diplomat. He was a cornerstone in the foundation of the United States. He discovered practicable uses for electricity. He was America�s first great satirist. He founded the University of Pennsylvania. He invented bifocals. He was a legendary ladies� man. He was all of these things...and was so much more. 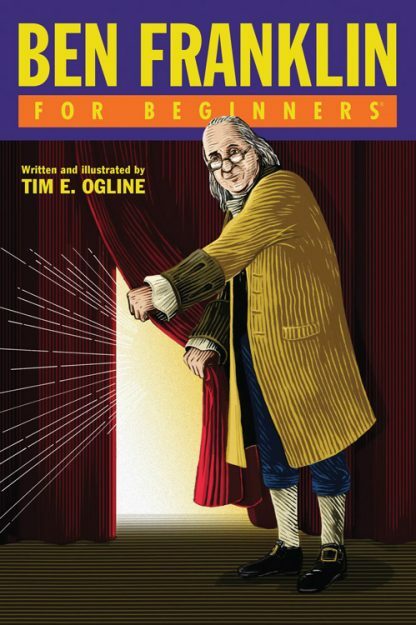 Ben Franklin For Beginners<?i>, written and illustrated by Tim E. Ogline, opens the book on Benjamin Franklin and tells the story of his life and times with wry wit and whimsical drawings. Tim E. Ogline, Principal of Ogline Design in Greater Philadelphia, is an award-winning illustrator whose work has been published by The Philadelphia Inquirer, The Wall Street Journal, Utne Reader, Institutional Investor, and Philadelphia Style among others. Tim is also a Contributing Editor (and former Art Director) of the Wild River Review (an online literary and arts journal). Ogline has also been an Adjunct Assistant Professor at Temple University�s prestigious Tyler School of Art.